This was a fun project that added a lot of storage in our basement for tools, house goods, hunting/fishing equipment, home brews and more. These shelves are incredibly strong and much cheaper to build than buying shelving at the store (not to mention better quality in my opinion!). I won't have exact instructions from this build as I wasn't planning on posting it, but I'll give you some ideas and of course you can always ask me any questions. Remember, trucks are your friend. The shelf I made is an "L" shape. 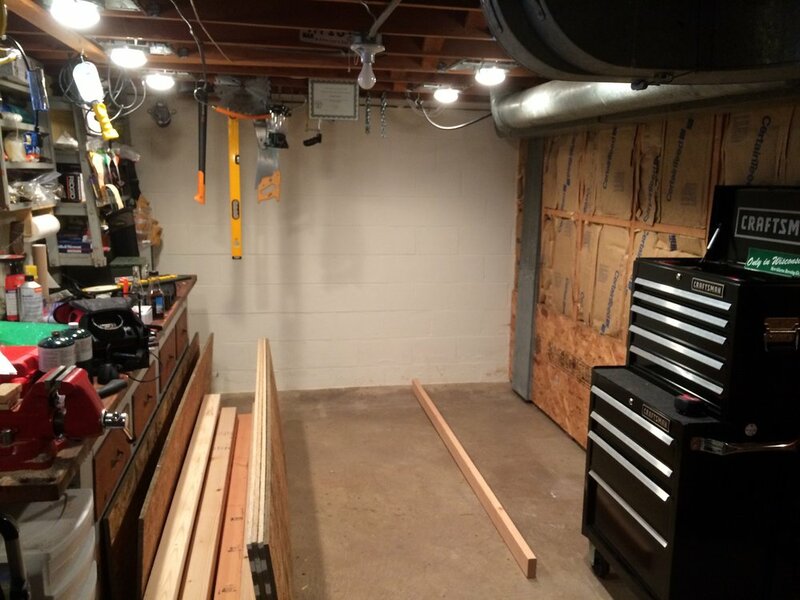 The longest side is 8 feet long (most 2x4's and plywood sheets come in 8 ft. lengths). 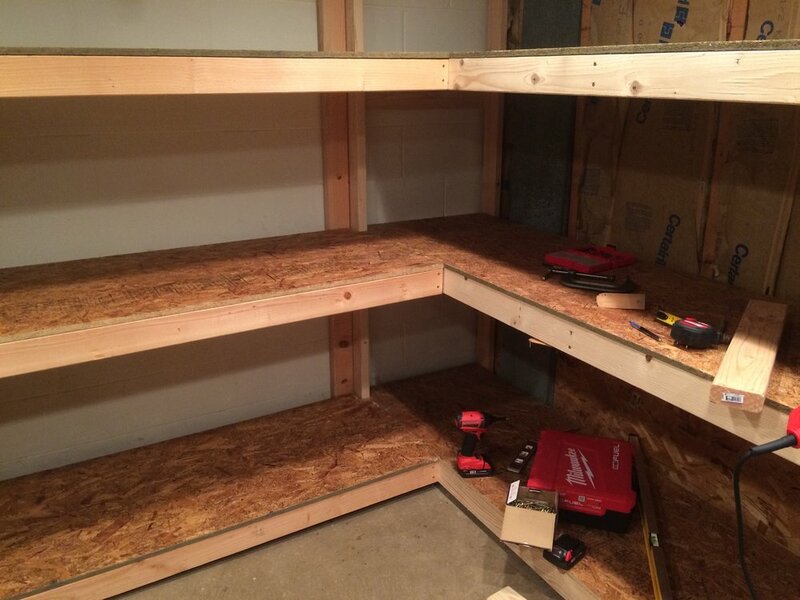 The depth of the shelves are 2 feet (cut a 4x8 sheet of 3/4 in. thick plywood in half the long way). The height of the vertical posts are 6 ft. The corner I plan to build the shelves in the work area of our basement. Having the shelves 2 ft. deep I find is the perfect amount of space to hold a lot of stuff without making it too deep to be able to reach back. 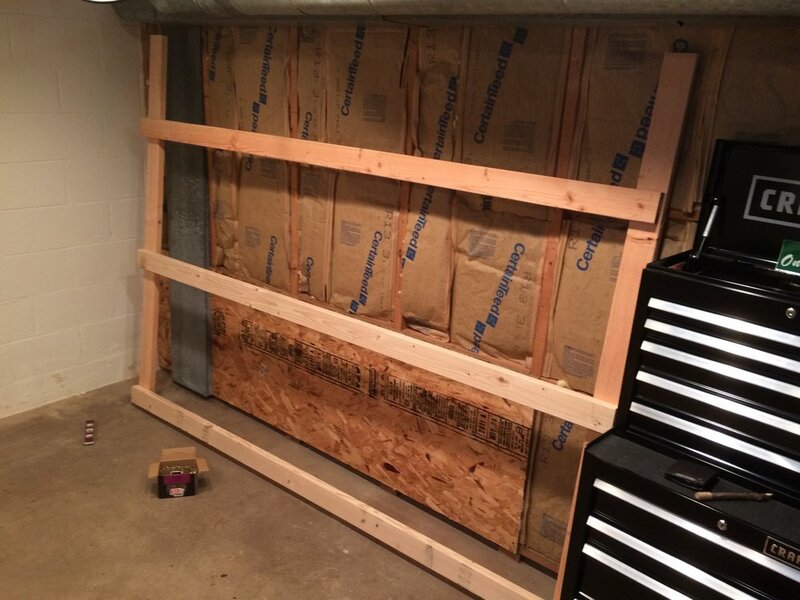 Also, having these dimensions (with 8 ft length boards) simply makes buying and cutting up the lumber a piece of cake. I made the space between the bottom shelves have a little more room for larger items than the middle shelf. The top shelf of course can be stacked to the ceiling if needed. In the next series of photos you can see the progress of the frame. I first started with the longest side. 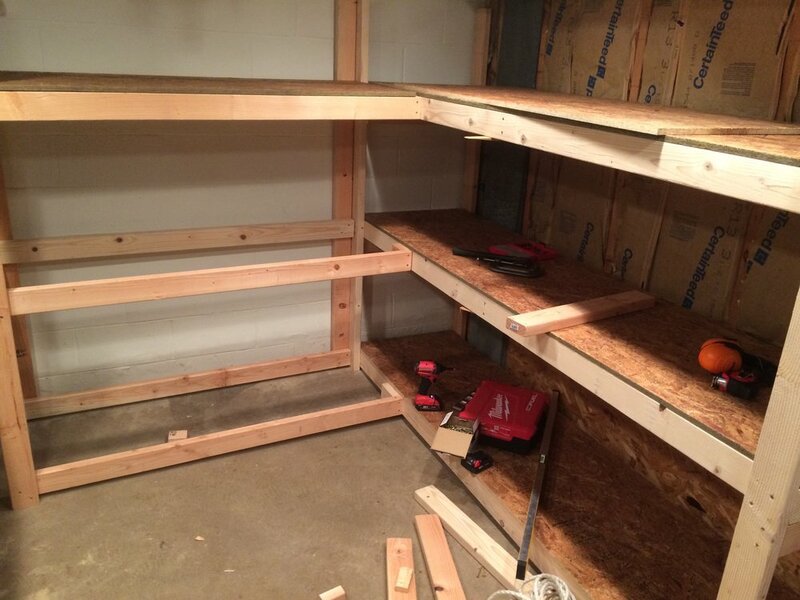 I built both halves and once those were complete, I placed braces and plywood between the two to have solid shelves. In a nutshell, I basically have the plywood resting on crossbeams which area resting on other crossbeams and everything is screwed into each other. There are 2x4 braces in the center of the plywood in a few spots as well to ensure that no heavy load could sag the plywood at any point. Then I started the other part of the "L". It was important to me that in the "crotch" of the "L", there were no posts that would get in the way. I wanted to be able to move large objects on and off the shelves without hitting a board right in front of me. You can tell from the photos that I have extra posts on the back side, but in the front I devised a way to attach the new 2x4's to the old 2x4's of the previous frame. I essentially have 2x4's tied into blocks as well as 3 inch screws coming from the inside of the other frame into my new set of crossbeams to ensure a solid build. Does anything I said make sense? Not at all. Without better pictures showing the whole process it is a bit hard to explain. If however you are a bit handy and study the photos, you should be able to understand just what I am doing. Or ask! And there you have it! 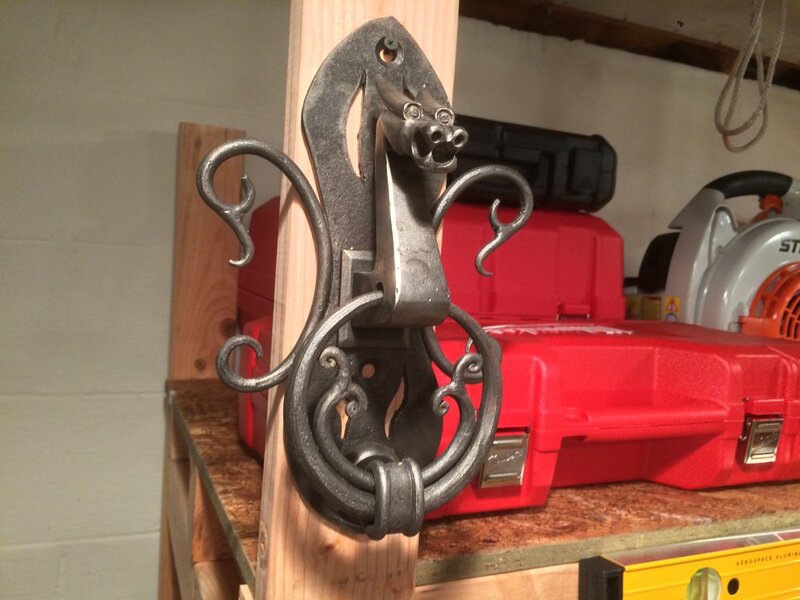 At the end of the project, I bent some curtain rod brackets and screwed those on to hold my level, screwed on a pencil sharpener than came with the house, bolted on some weird iron door-knocker I got from a friend and called it a wrap! Many years later and much more stuff, the final product is holding up great!